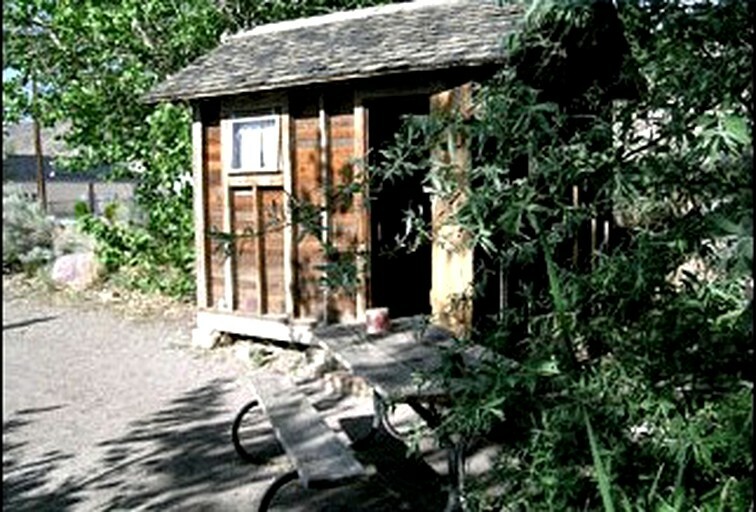 Grow Cabin: This cabin was the first cabin on the property. It is in the campground closest to the bathrooms with showers. 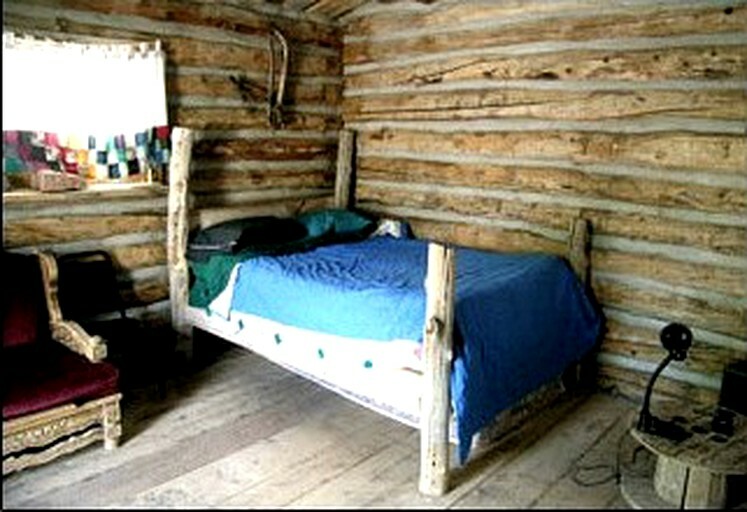 It has two single beds and two single mattresses under the beds. It has electricity, a ceiling light with a fan, and a heater. 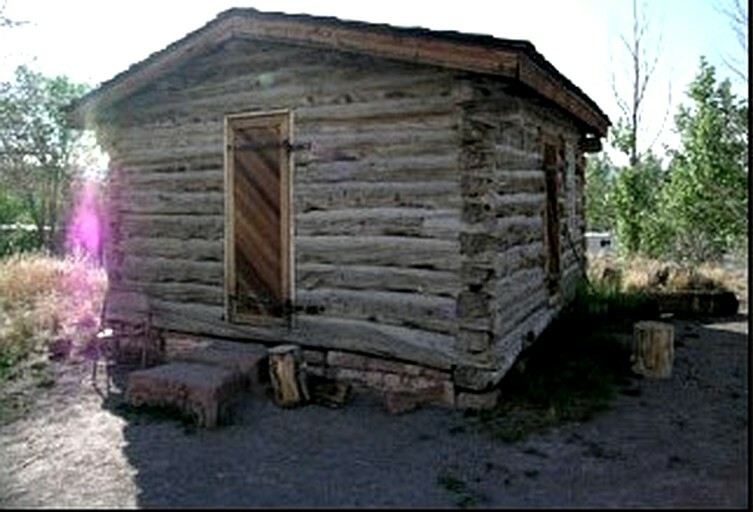 The Barney Cabin: This cabin is up by the main building, it was the first Pioneer cabin moved onto the property. Five children were born in it during the Pioneer days. It has a double bed, a single mattress under the bed, and a couch. It has electricity, a lamp and a heater. 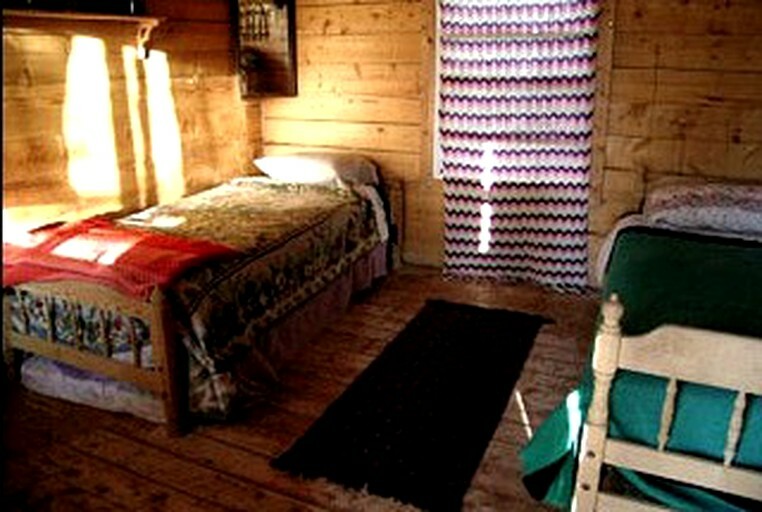 The Pond Cabin: This cabin is located by one of the fish ponds. It's cute and cozy. It just has a double bed and no electricity. It was made from an old chicken incubator. The walls are of recycled redwood, and the floor is from an old gym floor. 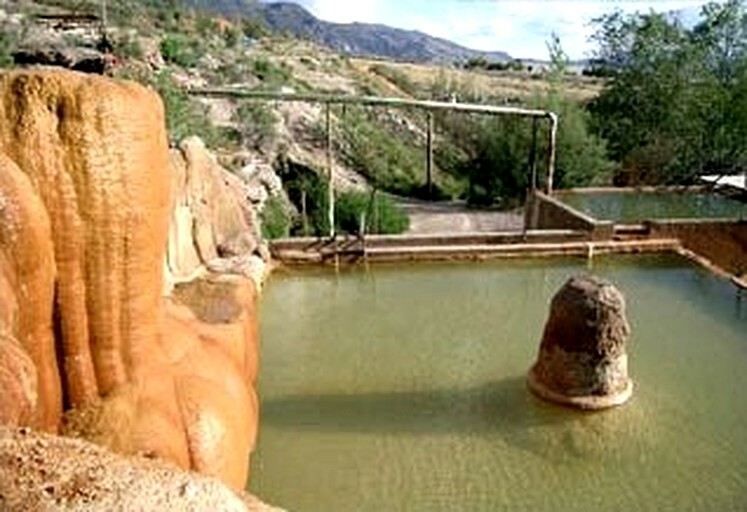 The natural springs on site are very special, with water coming out of the ground at 168 degrees Fahrenheit (75 degrees Celsius) and at 200 gallons/minute. As the water flows, the minerals cool and form layers of rock. 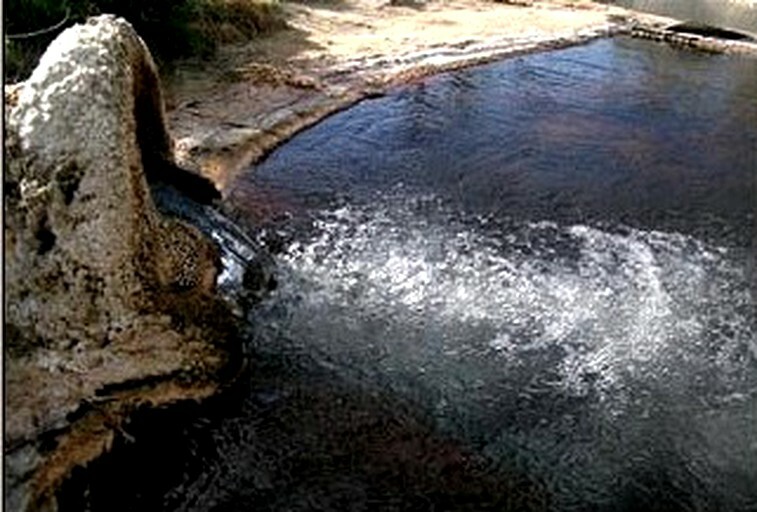 This spring has been flowing out continuously for millions of years. Over time, the mineral buildup has created a mound that is a mile across, 200 ft deep, 200 yards wide. As the water travels through a channel, it cools down, and it is then contained in eight bathtubs and two concrete pools. The pools and tubs are kept between 98 and 110 degrees Fahrenheit (37-43 degrees C.), so you are bound to find something you like. The temperatures can always be adjusted as necessary. The bathtubs are cleaned every morning. The pools are cleaned once or twice a week. The water contains lots of calcium, magnesium, and iron, which makes it best for soaking. It is not recommend for drinking, however, if you would like to drink it, it is advised that you acquire it from the source in a glass container and drink 1 oz per day at the most. Tubs 7 and 8 are usually the hottest. Five minutes in them can do wonders on aching muscles. 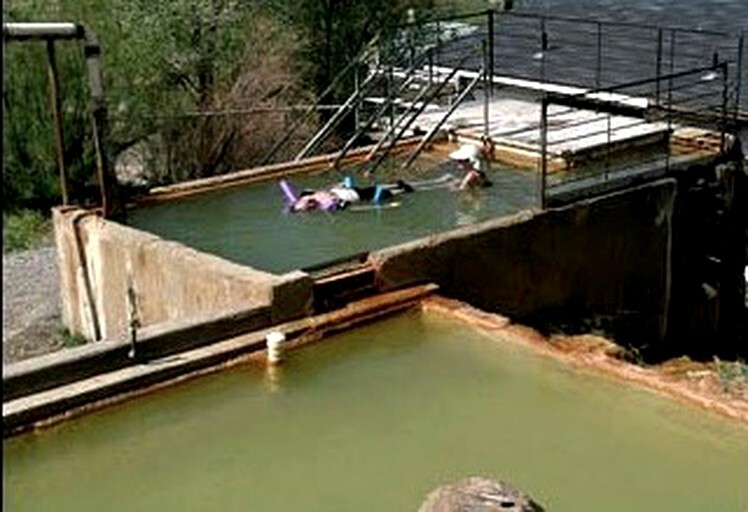 People come here, and after soaking they experience wonderful feelings of well-being! Our water is amazingly soothing and rejuvenating. The view from the tubs is incredible, and you can even watch the sunset from them! The tubs are also the best place to gaze at the beautiful stars. You can watch a meteor shower even in the winter! It's also beautiful to see the moon rise over the mountains. The shallow pool is 3 feet deep, so it is a nice depth and suitable for children. Activities such as hiking, mountain biking, fishing and climbing are all possible, without forgetting of course that nearby there are numerous national forests and national parks, as well as some of the USA's best canyons and monument sites. Less than 5 miles from Mystic Hot Springs there are stunning hikes and wonderful picnic spots available in Monrovian Park, part of Fishlake National Forest. Enjoy the time and open green spaces with the river and great views of the beautiful Utah country. The park can be reached by car, bike or on foot – a perfect excursion to the wonders of nature. And when you get back you will be ready for a soak! The indicated rates are for one-person occupancy. Any extra guest is an additional $30.